Microsoft is exhausting data center managers' objections to running Windows in the data center. With its recently announced Multipath I/O (MPIO), applications running on Windows 2000 Server and .NET Server will access an I/O fabric across multiple channels. Multipathing solves two problems: It provides for failover and load balancing between the multiple SCSI or Fibre Channel adapters. "Many people will not run, say, an Oracle database without multipathing software," says Rahul Mehta, CEO at storage software vendor NuView. Unix and mainframe operating systems are no strangers to multipathing. Veritas also delivers multipathing capabilities in Volume Manager, as does EMC with PowerPath. Veritas and EMC are just two of the 23 vendors that have pledged to support MPIO. Why? "They're doing it so they can offer seamless support to the Windows environment, and not have to rely on third-party software," says Rick Walsworth, director of product marketing at Maranti Networks, which is building an MPIO-compliant multiprotocol switch. May followed April's dramatic decline. What do whales and digitizing analog broadcast tapes have in common? Microsoft is exhausting data center managers' objections to running Windows in the data center. Bocada's latest version of BackupReport could make your life easier if you have to track multiple backup servers. TCO analysis: does it work for storage? TCO analysis is all the rage, but use with caution—the numbers can be twisted by vendors trying to make a sale. Here are some guidelines for designing virtualized systems. Dominant Fibre Channel switch vendors Brocade and McData have both made significant enhancements to their midrange 2Gb/s Fibre Channel switch platforms. Justify yourself to the budget committee - here's how. The FAS900 series breaks new ground in bringing together file and block storage. Director or core switch: which one works for you? Each brings with it certain assumptions about reliability and manageability. But there's hope: The architectures are converging. Despite all the effort storage administrators pour into backup, backups fail about 40% of the time. NAS vs. SAN? Who Cares? Taking your SAN beyond backup to run production databases requires the right layout, good practices and better integration. The benefits: high performance, floor-space savings and streamlined operations. Modular servers, separate storage and networked storage all add up to flexibility and efficiency unprecedented in the glass house. Storage Bin: After all these years, it still comes down to good old backup and restore. 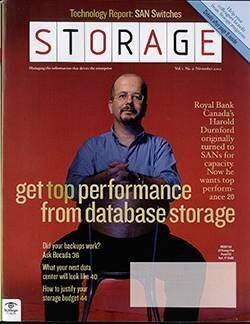 Our new columnist looks at creating a storage services group. Do you use 1Gb/s or 2Gb/s switches?